Today, I am going to attempt to give you a better understanding of the stained glass panels. And I hope to shed some light (no pun intended) on the individual messages they were designed to convey. First, let me offer an excuse for being in my age group- in the high nineties. Remembering details as you age becomes a little more difficult with each day. I am fortunate that I have two wonderful girls to gently guide me. Now, to the panels. When the sanctuary was constructed in 1985 (or close to that date) we had certain design criteria for the lighting from the roof windows- first proper protection from the weather and secondly, adequate lighting. The sanctuary lighting in many churches is based on a soft twilight-considered by many to have a more restful and sensitive worship pattern and darker stained glass panels at eye level. But we had hopes of finally achieving what you see, a satisfactory environment for our worship and adequate and properly located lighting. We wanted an environment that conveyed a message. We wanted to tell you the life of Jesus in pictorial form. When we finally felt comfortable financially, we looked for creative people who knew stained glass design and construction. We found two young men, immigrants for the nation Yugoslavia- a nation suffering extensive religious turmoil in that day. There stained glass skill came from working in their father's plant in Yugoslavia. When we agreed on numbers of panels and pricing, including installation, they located an area for construction in an upper level of a warehouse building in Huntington. We agreed on the subject matter for each quadrant and subsequently, as they developed sketches, they finally completely all the panels and we made arrangements for installation which necessitated the placing of supports and ladders which caused some difficulty in reaching a seat. It was a challenge to our ministers because of the congestion and debris. Now, finally, to the panels. I am going to start with the easy one- the soft fresh light of the morning to the calming mellow light of the evening that looks down on you when you enter the front door. You see it's clarity and beauty every morning when you enter the sanctuary- if you look up. Now I will move to the front- which gives a summation story. First, the birth of Jesus in the town of Bethlehem- a small town just south of Jerusalem. The second panel depicts his maturing and the beginning of his ministry, particularly in the area surrounding and west of the Sea of Galilee. 400 references to sheep if you also include the word "flocks". The qualities of "sheep and shepherd" made them good symbols for spiritual realities. The shepherd is an idealized figure of simple virtue and caring leadership. The remaining panels in this quadrant give a summation of his later life and death. Now, let us move to the bottom panel in the south quadrant where I and the panel designers made a historical error- there were no shelters on fishing boats in the time of Jesus. Boats of that day were about 26 feet in length with 7.5 feet in width and could hold about ten fishermen with their gear and nets. How do I know this? Two ways- I read about it- and Opa Jones and I, during my last visit there saw a Galilee boat on display that had been uncovered in silt during a very low lake water level (a very severe dry spell and heavy use for the nation’s population needs). Carbon dating tests determined its age- no shelters. Let’s now see what Jesus was doing in the Sea of Galilee and Lower Galilee. The Sea of Galilee, specifically the town of Copernican on the north shore is where Jesus began his ministry. This town, was where he was living (he was not welcome in Nazareth- they did not like his teaching) - and it also had an advantage- a major east-west trade route which gave him more of an audience. Many of his miracles were performed here. Bethesda, nearby, was the said location where the feeding of the multitudes with the loaves and fishes occurred (about 5,000 people). Matthew 4:23-25 notes that as Jesus taught his "good news of the kingdom" and healed multitudes, large crowds from the surrounding region followed him from place to place. Jesus subsequently denounced the cities where many of his miracles had been performed because of their lack of repentance. Jesus left Lower Galilee, went south and avoided the area of Samaria going over to the Jordan River Valley. He and his disciples finally arrived in Bethany, a small town south east and less than two miles from Jerusalem. Here lived Martha and Mary, two sisters Jesus had visited previously, as well as their brother Lazarus, whom Jesus had awakened from the dead. Leaving Bethany, Jerusalem is approached by passing over the Mount of Olives into the Kedron Valley. He was riding a donkey as a symbol of association with the oppressed. The first panel shows Jesus on the donkey. In the next panel Jesus moves to the Temple and, (dismayed by the hustle and bustle of the money changers and animal peddlers) said "Is it not written, my house shall be called a house of prayer for all the nations" and in addition spoke more damaging statements including "you have made it a den of robbers". One writer says-"this last statement sealed the fate of Jesus". The next panel shows Jesus praying in the Garden of Gethsemane located on the rise of the Mount of Olives and almost east of the Temple Gate. Here he was betrayed by Judas, then executed. This completes my discussion on the panels and notes what we were hoping to convey with the panels message. I have two colorful photos (taken in the last five years or so) that I would like to show you. The first is of Mount Tabor in Lower Galilee. This is a mountain about 2,000 feet above sea level and is the location of the transfiguration- where Jesus took his most trusted disciples- "Peter, James, and John" and he was transfigured before them. You can ask Sue McClung about the ride up the crooked road to the summit. Note the surrounding lush growing fields. There are under ground water aquifers that have been feeding this area for hundreds of years. 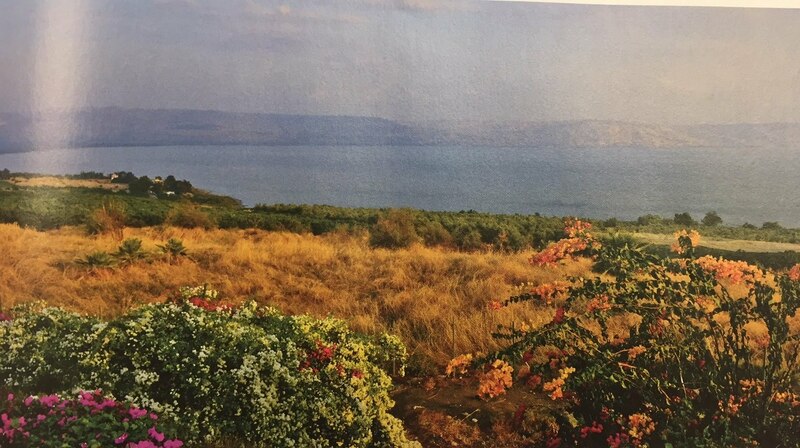 The next picture is my favorite location in the Nation of Israel- the Sea of Galilee. This was taken in the Capernaum area looking south. 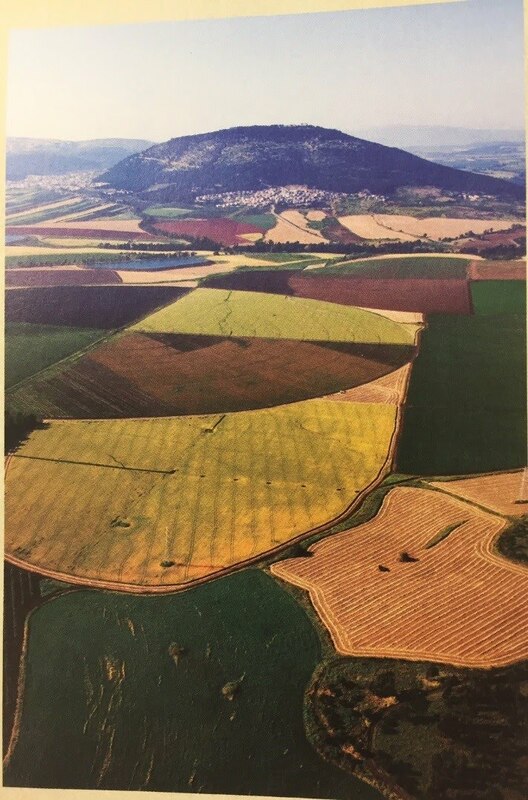 The beautiful sloping ground is where most researchers say was the site where "the feeding of the multitudes occurred". If you look very carefully at the left (or east) shore you can see where Nova Childress parked herself on a wharf and I had a difficult time getting her back on the bus. The Golan Heights are behind the Mountain Range in the right distance and a few miles to the east is where Lana Hays grandparents lived. I leave you with a final statement. If you remember only one of the panels and the message it conveys- let it be the third panel up in the front assembly- Jesus and the sheep. Jesus left us with a central message. Be a good shepherd to your fellow man, preserve and care, and when you close the book on your stay on this planet called Earth, let it be said that you put more back than you took out. You may ask "how can I be certain that I have achieved that goal?" The answer is simple- "be a good shepherd".